Great news about gcompsw ! Any idea for a price ? The price will be known once I update gretrostuff.com with newest gcompsw photos, features etc. Superg: Searched high and low for a direct way to message or email you. This is the best I have. Edit: Glad we got that fixed! Ok, I enabled Chile, Taiwan and Thailand. South Korea is also safe to ship. Please unlock international shipping. SuperG, I was wondering if you have already sent out all orders from the first batch. Been waiting patiently and can easily wait longer, but perhaps you have already shipped my unit... One can hope. I got a confirmation from my manufacturer that gscartsw ETA is March. They are on holidays currently. Yesterday, the payment page was open, and the international shipping cost for South Korea was 9999usd. "long time ago" was about first sub batch shipping. Question from a noob here. Would it be possible to use 480p to 1080i through the gscartsw to a PVM via a [SCART to BNC] cable? It would be very expensive to buy all the things required and I don't want to spend $325 US (or my $437 Canadian Loonies) for something that won't work. Edit: Would I even need the Garo? It's an additional cost that (If I'm seeing this right) I wouldn't need according to the SCART pinout, but then I would need a way to get the YPbPr video into the gscartsw still. You don't need a transcoder with the newest gscart or the old gscart 3.4, you would need one for the gscartsw_lite. You would simply need a YPbPr to SCART pin adapter for the new gscartsw and it will pass it through. For the gscart 3.4 or earlier, you would need to use the same pin adapter as the current model, but you could only use it on input 8, which is what is defaulted if no signal is detected. The gscart_lite doesn't have a default output if nothing is detected, so you would need the transcoder. Is Gscartsw 3.4's port 8 really capable of passing through 720p/1081i component signal with YPbPr to SCART adapter? I tried to do that outputting to my Multiformat BVM and while picture got through it's quality was very bad. 480p signal with same method on the other hand was perfect. HD on v3.4 is not tested by me (nor supported). One thing for sure is that signal detection isn't fully functional. Port 8 will omit the detection part so signal will go through multiplexers only. I didn't test such functionality myself but I got the reports that it works. Try to disable sync stripper. Also what are you connecting and which gscartsw v3.4 output are you using? Somehow I also remember reading that HD resolutions aren't officcially supported with 3.4 so that just confirms it. I tested WiiU and PS3 on 720p with component cable through Gscartsw 3.4's port 8 using YPbPr to SCART adapter to Sony BVM-D24 monitor. I used Gscartsw's scart output in my tests. The picture was soft and blurry. If I connect consoles straight to monitor with component cable picture is sharp and crystal clear. I tried same thing with Wii in 480p mode using component cable and picture was as good as straight connection. I just assumed that maybe this happens because Gscartsw 3.4 only supports signals up to 480p and wanted to confirm that. 3.4 also has the low pass filter enabled unless you mod the unit. I tried PS3 720p straight to monitor using YPbPr to SCART adapter and picture is perfect. So that confirms my adapter is working like it should. I also tried the initial setup going to OSSC instead BVM and the result is blurry picture with that aswell. LPF could definitely be causing this. I just wonder if anyone has succeeded in using HD resolutions with gscartsw v3.4 or is it just that resolutions up to 480p are working really? I've used HD quite a bit through the 3.4 utilizing a garo on port 8. I modded my LPF ages ago. Hmm. Seems like disabling gscartsw's LPF by mod is worth the try and possible cause of my problems. Just not sure if I bother doing it as is the new switch promised to work in similar situation and SuperG has confirmed that working already? I'm waiting for one so I think that will be my final solution anyway. I'd say LPF difference is quite subtle, last time I looked into it here it was quite minor on my setup, almost invisible. It could be something else. So you used YPbPr->SCART on input and SCART->YPbPr on output and then component male->BNC cable to your BVM, correct? How are your cables, good quality? The new one works as well for HD on all ports instead of just port 8. I just got my 5.2 last night and it works great. I happened to want my 3.4 as the last switch in the chain and it works great chaining the 5.2 into the 3.4 as long as you commit to dedicating port 8 for that. Using ports other than 8 cause somewhat flaky sync detection behavior on the 3.4. As SuperG mentioned, it's because the 3.4 has no official support for HD. I have console's component cable going to RGC cable like this (https://www.retrogamingcables.co.uk/aud ... rter-cable) with the help of these kind of adapters (https://www.amazon.com/Generic-Coupler- ... B00LHIBYB8). Scart head of that RGC cable is going to port 8 of Gscartsw. Then I have thick quality scart cable going from Gscartsw's scart output to this RGC cable (https://www.retrogamingcables.co.uk/aud ... verter-bnc) where it's BNC end goes into my BVM's inputs. I've been using same cables for ages in my setup and they have worked great. Not sure what I could switch around. Gscartsw doesn't have sync stripper on either. Actually I also have Garo but it gave me more problems than solved when I used it in past. I used it with Wii, Xbox and PSP Go mainly. I could try it in this situation as I haven't tried any newer consoles through that. What is the exact signal chain you use Garo in, DirkSwizzler? I use XBox, PS2, Wii, and PSP going into a 4:1 gcompsw. That feeds into a garo with Guspaz's modifications to pass sync through instead of splitting and recombining it. I believe the mod also fixes some color distortions in some situations. My memory is crap. Then I believe I still had to feed it into gscartsw 3.4 port 8 for HD signals. Then directly into my OSSC. In the past I've had success using an unmodified Garo on port 8. Or running it through a gscartsw_lite with sync regeneration on. Or using the Garo's RGBHV output into a Kenzei. I mean if that approach works for DirkSwizzler, it should work for everybody. Those adapters should definitely be in everyone's toolkit if they do anything with SCART. While I don't use them in my day to day setup. They're super useful for eliminating variables. And your cable adapter chain definitely looks suspect. 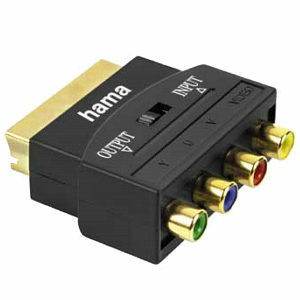 On the subject of BNC to RCA adapters. Make sure you're getting quality ones and not a 10 pack of junk from Amazon. I believe that when RetroRGB was learning to use his scope. He and Ste discovered he was getting screwy results because of bad BNC adapters. I can try to find one of those small adapters for sure. Still I doubt it's my adapter that is the problem here. I mean how come I get pristine picture in BVM with same chain including same YPbPr to SCART adapter when I drop gscartsw out of it? My cables are all from RGC so shouldn't be low quality ones either. If I coudn't get great picture with that adapter in chain no matter what I do I think that would be the easiest to blame as it's newest addition. I bought Hama adapter from Ebay now. That's pretty neat and useful to have in any case. Do you have one of those adapters aswell, DirkSwizzler? Would it be possible for you to try running PS3 component cable through gscartsw v.3.4's port 8 to OSSC with the help of that adapter and see what result you get? That's pretty much same chain that I have tried. I have used HD Retrovision cables with PS3 when doing that. Sorry if this has been known/established for ages with the previous gscartsw_lite, but over the weekend I tried connecting a Wii in 480p via component-to-SCART passthrough to a Sony BVM that supports that resolution (multiformat), but couldn't get a signal. Direct cable connection to the Sony BVM worked fine. Am I right in saying the gscartsw_lite doesn't support this? Will the new model coming this year? gscartsw_lite required a sync signal to pass an input through to the output. So does gscartsw v.3.4 actualy. But the gscartsw v3.4 case it defaults to input 8 when there is no sync detected on any inputs. You would need to "trick" your gscartsw_lite into selecting an input in order to pass a component signal through. How about if the Y (luma) signal was input on both green and composite. Then the output composite signal is ignored. I guess that would double the load on the Y signal. But i think it would work. You are correct about doubling the load. It doesn't make much sense to do this anyway as it will affect quality.